Antibiotic is a word that means “against life”; they kill both good and bad bacteria. Maintaining your good bacteria is important during and after the use of antibiotics. While doctors commonly recommend eating yogurt or taking probiotic supplements during and after a course of antibiotics, most yogurts and probiotic supplements do not provide either enough probiotics or enough Bifidobacteria. Ultimate Flora Critical Care was designed to support the probiotic balance in both the small and large intestines.Each capsule contains 30 billion active Bifidobacteria, the primary resident of the large intestine. 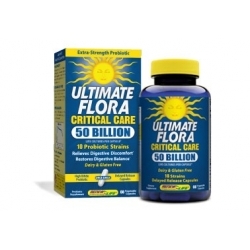 To help maintain microflora balance in the small intestine, Ultimate Flora provides 20 billion active Lactobacilli and Lactococcus cultures.